In the restaurant there is a large beautiful red oven imported from Italy.. Who would have guessed? The space is bright and kind of cool looking and well, all things were checking out.. When we sat down, we were presented with a happy hour menu.. 6 dollar glasses of wine, 6 dollar plates of calamari, 10 dollar pizzas... Whats not to love. Well, allow me to answer my own question.. The food, the service and the wine.. I started taking photos but, as things came out, it was not worth my time remembering.. One of the easiest things to do is fry something.. 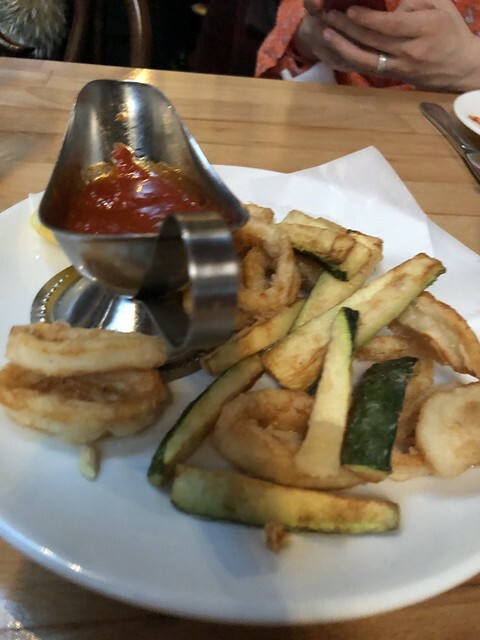 This was like rings of frozen calamari left to gently poached in some kind of oil.. it was soggy and not crunchy and I don't know if they even coated it with flour.. the zucchini was even worse. tomato sauce was decent. The pizza was tan, the pasta was tasteless and 25 dollars.. The desserts were brought in by Bindi which at least meant their kitchen wasnt touching it..
Staff was apathetic and uninformed They forgot 2 rounds of wine on the bill, they forgot to put in the calamari, they forgot to put in our dessert, they didn't know the difference between fresh ricotta and ricotta salata. On a cucumber salad, they told us it comes with fresh ricotta, that really excited us.. We actually asked our waitress if she was sure it wasn't ricotta salata, she went back to the kitchen to confirm.. Definitely fresh ricotta.. Out comes semi rotten cucumbers wth ricotta salata and no dressing.. they forgot to put dressing on the salad. I heard the waitress talking to a table of guys directly behind us... She gave them bread and butter? Apparently they offer this to some tables.. Then she said, oh my god, I have been talking to you guys for so long I completely forgot to put their dessert order in.. .She then walked up to our table and said, your dessert will be right out. It was so strange. A 25 dollar pasta dish had three vegas cocktail shrimp and the most grey looking frozen fish filet plopped on top.. It was dry and tasteless. But yeh, the upsetting thing is they have this yelp marketing team that literally gives them 8 5 star reviews a day sometimes.. All from people with many friends and one to 6 reviews.. I feel cheated. You ordered wrong. You shouldn't have ordered the food.